Are you the type who is passionate about helping people survive potentially life-threatening situations? If so, it may be time to update your Emergency Medical Technician or EMT resume and land a job in this career which is projected to grow by 23% in the next 5 years. An EMT needs to be proficient in a number of skills. You may have the necessary qualifications but in order to be noticed, you should be able to present your strengths in a way that would capture the attention of the Hiring Manager. If you’re thinking, “How should I go about that?” Don’t worry! We can save your resume in the same way you save other people’s lives. Review our EMT resume sample and study how we put together its content and arranged its various sections. To be sure, we included a write up that answers all questions you may have on preparing a resume. Address: 1789 Chirichachua Street, Willow Wood, Albuquerque, NM.. Licensed EMT with more than 6 years experience providing medical and emergency assistance to people of all ages and health conditions. Other than my experience and expertise, I am well-traveled, have a high level of fitness, ability to thrive and maintain composure during stressful situations and overwhelming regard for human life make me an ideal fit for Banner Medical and Emergency Responders. 6+ years experience as an EMT. Lifeline Healthcare Systems, Albuquerque, NM. Responds to both emergency and non-emergency calls while maintaining high level patient care and service. Conducts a thorough examination of the patient and looks for signs/ symptoms of injury or illness. Performs first aid and required medical procedures as covered by the policies and procedures of Lifeline Healthcare Systems. Provides care and ensures stability of patient’s conditions prior to and during transportation to hospital. Drives/ takes responsibility for the company authorized ambulance and upon instruction of the Charge Nurse. Gambit Casinos and Entertainment, Las Vegas, NV. Member of First Responder Unit that manages the scene of the incident/ accident in order to reduce risk of further injury to the area and bystanders. Extracted, recorded and organized all pertinent personal information from patients. Periodically reviewed and evaluated facilities and highly populated areas for potentially hazardous conditions. Tasked to routinely check identification of patrons if they are over the age of 21. Prepared accident/ incident reports as well as witness statements. Regularly monitored surveillance and security equipment. Parkway Recreational First Responders; Vancouver, Canada. Monitored park and camping grounds; provided medical and emergency assistance whenever necessary. Immediately attended to distress calls from park visitors on possible intrusions by wild animals and venomous insects and snakes. Patrolled the park grounds after closing hours to ensure area is clear of hazardous materials, obstructions and dangerous animals. Took down statements from personalities involved in accidents/ incidents and filed appropriate reports to principal office. Conducted investigations into incidents that have resulted in injury, loss of life or damage to property. Assigned a company vehicle used to transport patients to hospital. 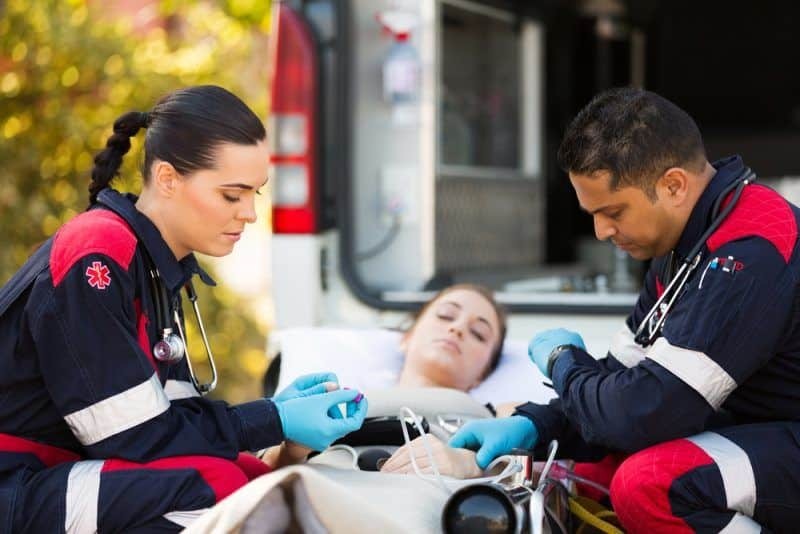 Your EMT skills list must show you have the training, education, physical capability and ideal attributes to help people during times of emergencies and potentially life-threatening situations. Becoming an EMT is no easy task. Hospitals, clinics, healthcare offices and first responder agencies want to make sure you can be trusted with the safety and well-being of their patients. Education. A high school diploma or the equivalent will be enough to get you considered as an EMT. Of course, a two to four year course in a medical- related field will be a huge advantage but getting certified and licensed is more important. Certifications/ License. As you have read from our example of a resume for EMT, the standard training/ certification program covers three to four stages: Basic, Intermediate, Advanced and Paramedic. Each course takes around 6 months to complete but are necessary for you to take the licensing exam. Every state has their own set of requirements to become an EMT. But you can be rest assured, state licensure will be one of them. Physical Fitness. EMT’s are like firemen. The job can be physically demanding. You will be carrying heavy equipment and may be asked to transfer people who have been immobilized. The work hours are unpredictable. In some jobs, you may be asked to cover the late night to early morning shift. Perform under Pressure. In severe accidents, time is of the essence. You might have to pull out people from a burning wreckage, perform CPR or first aid procedures to stop the bleeding. In some cases, you may have to help women deliver birth. Every situation will be different and you should be able to maintain composure and follow procedure to the letter. Great Interpersonal Skills. EMT’s work with a team. Communication is important so everyone can stay coordinated and remain on the same page. You will also come across victims who may be in a state of shock. You should be able to calm them down and help them believe that they will survive the ordeal. The first thing a Hiring Manager would look for in your EMT resume objective is whether you are licensed or not. When human life could be at the balance, healthcare providers won’t take chances with someone who has not been certified as a trained professional. In our sample resume objective for EMT that’s how we precisely started out. Knowing that you are licensed will put the person reading your resume at ease. He/she will proceed with the rest of your application. Overwhelming regard for human life. The last 3 are soft skills otherwise known as personal attributes that we believe are most appropriate and important if you are an EMT. Lastly, always give your objective statement a personal touch by addressing it to the potential employer. Experience and qualification are almost at an even footing when it comes to the job of an EMT. That said, if you have continuous employment with gaps of no longer than four months, use the reverse chronological as your EMT resume format. The Hiring Manager will only scan your resume. With the reverse chronological, he/she can immediately see your latest accomplishments. The reverse chronological highlights career and educational growth. With the Functional format, greater attention is given to your qualifications than experience. If you noticed, we placed Certifications/ Licenses ahead of Education because Jason only completed high school. If you have an entry level EMT resume, you can simply adapt the Functional type described in the previous section as your format. Use the objective statement to share your story on why you decided to embark on a career as an EMT. Review the job post then evaluate your current employment. Determine which of your present set of responsibilities can be qualified as transferable skills for the work of an EMT. Just like when you are applying procedure to a patient, don’t leave anything to chance. Go over our EMT resume writing tips before finalizing your application. Substantiate Qualifications with Details – Every city or state will have their own regulating agency or licensing body for EMT’s. In our resume sample for EMT, we used NREMT which is widely recognized in many U.S. states. Always include the name of the licensing body and the year you acquired professional status. The same applies to the certification courses. Indicate the name of the agency, the type of certification and the year you obtained it. Highlight the Diversity in Skill Set – If you have had multiple employers, do your best to differentiate your scope of work. Go into detail and show the potential employer you have a wide range of skills to reach into when the need arises. Validate Your Level of Fitness – Physical fitness is very important for an EMT. It is not enough to merely state you are “physically fit”; you should give the Hiring Manager an indication that you are ready for the job. Use the Personal Information section to share your hobbies or interests that keep you in tip top shape. Don’t hesitate to use our EMT resume sample as a reference before finally sending out your application. That’s what it is for! If this EMT resume example wasn’t sufficient for you, you are free to review some other samples and templates from our site. Browse to some related resumes below and find your inspiration.